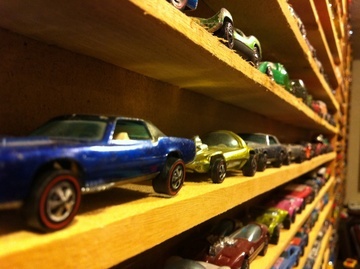 Any Hawker is a Hot Wheels and Matchbox collector with over 18,000 cars. He's a dedicated collector in Colorado. He has over 10,000 Hot Wheels, but he also have thousands of Matchbox, Greenlight, and other smaller scale cars, plus a large collection of 1/18 Scale models. He never sells his cars, but he does give them away to kids to get them interested in the hobby. His Mom created his interest by buying him one car at a time from K-Mart when they would go to Colorado Springs. "When a child starts looking at cars in a store, I back off to make sure they get what they want." You won't see Andy Hawker pushing anyone away to get that special collector car. He loves collecting, but he loves sharing even more.